Tired of wasting your time reading books that aren’t right for you or you picked them up at a bad time? We’re here to help. 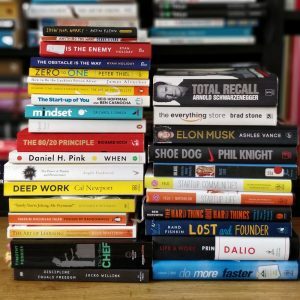 Our mission at The CEO Library is to cut through clutter and guide you towards the best books that will make a difference in your life, question your assumptions and help you improve. Books are an underrated opportunity to peek inside the minds of amazing people. Others struggled with the same challenges before, so why not learn directly from the best and access quality knowledge? However, certain books can also be huge time wasters, since so many are full of nonsense, bloated or media-hyped. Even if a book is great, it might not apply in your situation, doesn’t come at the right time, or is guilty of survivorship bias. In the world of constant noise that we’re living in, we’re the skeptic voice that will identify superfluous information and point out potential biases. We’re the ones who extract the best ideas from independent thinkers we respect, put them into context, and help you understand why they might be relevant in your particular situation. Oh, by the way, we’re not a website related only to CEOs – in that sense of externally validating job title. Instead, think of us as the ones that will point you towards inspiring books that will help you take charge of your life and become your own CEO. We started the website in September 2017, as a place for all the books that shaped the journeys of people we admire. Since then, we’ve interviewed over 200 people who are among the best at what they do, and asked them about their reading habits and favorite books. We’re putting a lot of effort into reading, reviewing books, interviewing people who are the best at what they do and creating content that will make a difference. A book suggestion that comes at the right time might change someone’s life. Our best content is available for free and not supported by ads. If you find value in what we do and want to help us reach even more people in the future, you can contribute by supporting us on Patreon. Cristina’s in charge of The CEO Library. Reading is the default activity that she falls back to when she isn’t writing or… running. Whatsoever, this hasn’t always been the case. As a small kid, she taught herself how to read and devoured everything from her parent’s bookshelves. Her mindset shifted when she started school and reading became mandatory. From a pleasant activity, it turned into something she rejected, and years went by without her finishing even one book. Only when school years were over, was she able to enjoy reading once again (Ryan Holiday‘s writing helped). Cristina’s now painfully aware of all those years when others gained an advantage by absorbing knowledge from books. She made it her mission to help others transform their lives through the right books. She started The CEO Library after a decade of experience working in the Romanian music business – first as the founder of what became the biggest music blog in her country, afterwards as a digital strategist and marketer for indie musicians (especially from the hip-hop and rock zone). She also has a personal blog, or you can connect with her on Twitter or Instagram. He’s an avid reader, entrepreneur and investor. Reading was always his “hobby”, no matter what else was going on in his life. From fiction (he loves SciFi books) to non-fiction (business books and biographies, mostly), he’s reading a lot when he has the chance. At some point in 2017 he looked at his Kindle and asked himself: Why did I download all these books? Who recommended them? Contributing with our social media content and promotion: Ștefan Hadar. Thanks to our previous contributors: Vlad Balan and Theo Grigore. If you want to get in touch with us, you can contact us here.